Hard to believe that this is a debut album from a young musician just starting out on his recording career. There is an assurance and confidence that belies his tender years that I've not heard for a long time. Precocious talent may abound in many circles, but it is rare that they elicit such a warm and positive feeling. That one is in safe hands as you listen to this outstanding album is immediately beyond doubt, as McCreadie leads you through a set of original compositions that are impeccably played, memorable and thought provoking by turns. 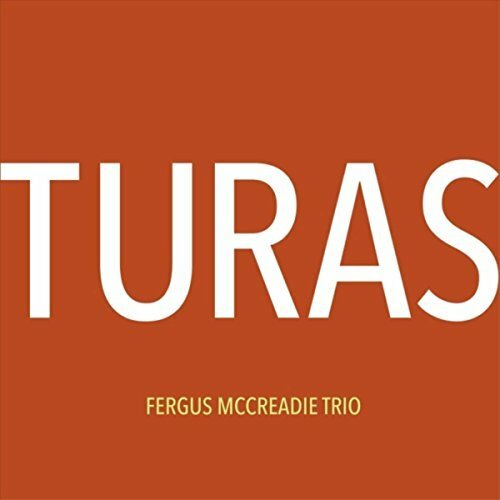 Turas is the Scottish Gaelic word for journey, and that is exactly what the album is. A journey not just through McCreadie's musical journey, and the road travelled in conceiving these compositions, but that of his native Scotland and traditional Scottish music. From the outset the juxtaposition of jazz and Scottish folk music is heard through the music of the trio, with the compositions strongly evocative of places in Scotland that have been visited by the pianist. 'Ardberg' with it's gentle and subtle opening theme statement is a fitting tribute to the distillery of the famed whiskey to the sedate and reflective 'Mull' which is reworked as an out of tempo ballad that seems to follow its own compelling path. Continuing the Scottish theme is 'The Set' which is paradoxically the most traditional yet the most original piece on the album. Moving between a jig and a reel, the composition is deeply infectious, yet still swings in a way that is familar to the jazz trio, an outstanding piece of writing and totally absorbing. This is immediately followed by 'The Old Harbour' which McCreadie describes as having a basic harmony "where I just took triad shapes and moved them through the diatonic scale." The mood of the composition is gentle and reflective, maintaining a disciplined focus on the original aim of the tune, negotiating several key changes along the way. The Scottish reel is again evident in the 'The Back Burn' where the trio are not afraid to tear things up a little with a driving and authoritative performance. The young pianist comes up with more intelligent writing on the wonderful 'Hillfoot Glen' which it's rolling opening piano statement and the way in which it evolves into a more settled time feeling with McCreadie and cohorts digging deep for the piano solo. There is also some wonderful accompaniment from bass and drums that retain the interest and feel of the overall concept of the composition. Citing the influence of Jan Garbarek and Arild Andersen, and other Norwegian musician's use of their traditional music in their compositions, McCreadie has felt a desire to incorporate his own native Folk music within the jazz idiom he loves so much, and in doing so has made a highly personal and hugely enjoyable debut. I can say with confidence that I have not heard such an impressive trio record from a Scottish (or UK) pianist since Brian Kellock's 'Live At Henry's' set.